I have too many handbags for one person! I think thats the same for a lot of women out there…. Its not a problem really, apart from when I come to change over bags on a day to day basis. Remembering where everything is, and not forgetting anything is key to this being successful – and therefore I need to get organised about it! Here are a few tips that have helped me – and I hope they do the same for you! Firstly, take out everything and lay it out so that you can see exactly what you have. Do this from ALL your bags so you start afresh with clean, empty bags! Start by throwing away all obvious rubbish – I’m always amazed at how much collects in my bags during the day – I must stuff things in there without even realising half the time – no wonder my back hurts by the end of the day the amount I am carrying around! Also throw away (cut up first) any credit or debit cards that are past their expiry dates. One of the main sources of clutter in my bag and purse is receipts. I purchase lots of things throughout the week, everything having its own receipt – and this builds up! What works best for me is to keep all receipts I get in a compartment in my purse, and then on a weekly basis sort through and decide what I need to keep, and then transfer to the relevant place (for expenses for my business these go in my business folder, for clothes and items that I may need to return or have a warranty I put them in my home file, and for genuine rubbish I put in the shredding pile). If you are a person who keeps all receipts to reconcile against your bank statement monthly, then simply transfer to a folder that you keep all receipts in, and purge monthly once reconciled. Are you carrying around the kitchen sink? Only keep in both your purse and your handbag whats absolutely vital – the last thing you want is to have to drag around half your possessions! Be ruthless. If you think you need everything then try this exercise – write down everything in your bag and keep the list in there with a pen. Whenever you use something during a week then tick it off the list. Whatever you don’t use in a week probably isn’t that necessary! Things can build up, and get heavy. Loose change is one of the worse culprits. I like to keep a change jar in the kitchen and both myself and my husband empty pockets and purse/wallets of the majority of their change daily. Its amazing how things build up – and I am constantly amazed that after a few months how much there is in there – perfect for a family treat! TIP – keep some spare change in your car ready for unexpected car park charges or toll roads. What if your purse was stolen? In your home file keep a record of the cards you have in your purse, and the relevant numbers to ring to cancel them – this will make the whole situation a lot more manageable if it happens. Just as with your home, having a place for everything in your purse and handbag is vital to ensure that you have everything with you and can find things at a glance. As I have business cards as well as personal cards, I find that it works really well to have a purse that has two main card sections in it – and I keep the cards in the same place every time – so its really easy to see if one is missing, and know what it is. I try and buy handbags with small pockets in the lining that are good for keeping spare change, phones, hairbrush, makeup etc… in and keeping them out of the way of the main compartments. I have lost count of the amount of times that I have missed calls because my phone is SOMEWHERE in the main part of the bag – so frustrating! So useful to have a small pad of paper and pen in your bag – for jotting down anything that springs to mind during the day including numbers, messages, websites etc…. Have trouble remembering PIN numbers? I always advise using different PIN numbers for every card you have – much more secure – but unless you have a great memory then this can get complicated, and its a complete NO GO to have a list of them in your purse! The answer? I find that creating a name in my phone that I know relates to each card is a great way of doing it. The PIN can be part of the telephone number, but is not easy for people to find at all. For example – a VISA card could be for Vera Isanda 01628 351 862, or a MASTERCARD could be for Mary Stern 01632 786 467. Keep the names and numbers in the same place for each and then it will be easy for you to translate! Have something in your bag that you can do if you end up waiting in a queue or in a doctors surgery etc…. – articles you want to read, or a magazine that you subscribe to – this will ensure that you use this time to your best ability. Just don’t weigh your bag down too much! I find it useful to keep a copy of the TO BUY list from my Home File in my bag at all times, as then if I come across something I think we need, I can check on the list and can make an educated decision there and then rather than having to come back to the shop to purchase it or return it when I get it home and find it doesn’t work. i.e. Hallway Unit – Dark Wood – max height 80cm, max depth 25cm, max width 100cm / A new pair of jeans size 14 blue / artwork for above sofa – max 100cm square with red and gold in it but mostly cream. Only use handbags that you love and that you love using (same with purses) – otherwise donate them to charity as they take up a lot of space to store. Your bag should work well for you, be comfortable, and work with your wardrobe and style. Your handbag should be something that works for you – not against you. If you are constantly rummaging around in the bottom to try and find your phone / spare change / keys etc.. then its time to get it organised once and for all! Theres nothing nicer than only carrying around what you absolutely need – being able to find it in an instant – and feeling organised as you go about your day. I hope that the tips given have helped you – and would love to hear about any tips you may have. 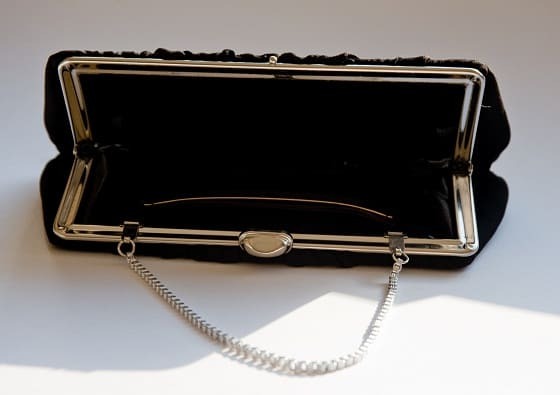 What do you find most annoying about an unorganised handbag / purse or wallet? ….. Previous Post: « WHAT TO PUT IN A HOME MANAGEMENT BINDER? Great tips there. I have all my card details registered with cardguard who also provide keyrings. We did lose a set once and had them returned via cardguard. If a card is lost or stolen you just need one phone call. Includes passport details as well. Bag organisers look like a good idea. I have a pattern for making one. You have prompted me to have a go. Could be useful in a beach tote bag too. Thank you for all your hints. Am making a Home File – also thanks to you! Thanks for getting in touch – glad you are taking some of the tips on board! I would love to see how you get on with the bag organiser and the home file – please keep me updated! Glad you have liked this post – let me know if you want anything else covered!